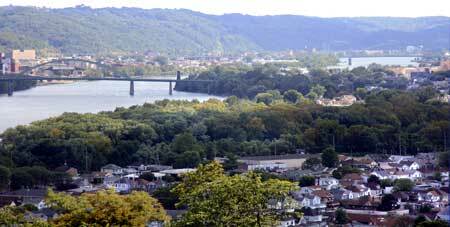 The town is built on two basic plateaus situated between a hill and the Ohio River. The lower of the plateaus, along the river, is dominated by a large industrial park, the Martins Ferry Football Stadium and by Ohio Route 7, a four lane traffic artery that runs from north to south across eastern Ohio. The higher plateau, which is the larger of the two, is predominantly residential and commercial, and is home to most of the city's residents. It gradually rises to a rather steep hillside in the west that forms a natural wall. Directly across the river lies the city of Wheeling, West Virginia, and just 11 miles to the east is the Pennsylvania state line. The city of Columbus, Ohio is 125 miles to the west, and Pittsburgh, Pennsylvania is only 38 miles northeast of the city. On the southern end of town, Martins Ferry is directly connected to the village of Bridgeport. Martins Ferry enjoys the honor of being the oldest permanent settlement in the state of Ohio, having been settled at least as early as 1779. The community was a westward extension of the city of Wheeling, Virginia (now West Virginia), but at that time settlement on the west bank of the Ohio River was not permitted. The town disbanded several of times before permanently taking hold in 1785 by Absalom Martin. 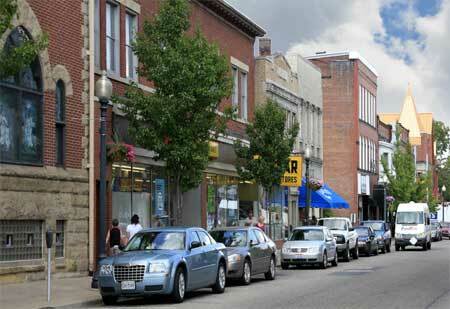 Unlike Marietta, Ohio's oldest city, Martins Ferry remained an unincorporated settlement for a relatively long time. 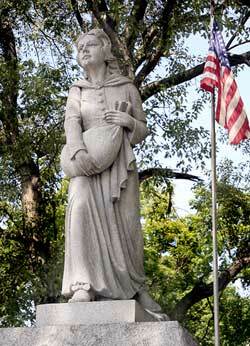 It did not officially become a city until 1865, a full 77 years after Marietta. Through the years Martins Ferry has been known as Hoglinstown, Mercertown, Norristown, Jefferson, Martinsville and Martin's Ferry (the apostrophe between "Martin" and "s" is no longer used). The name Martins Ferry was chosen for the Ohio River ferry that was owned and operated by Ebenezer Martin. In 1835, Ebenezer Martin, the son of Absalom Martin, redesigned the town with a grid system of streets, much of which survives to this day. It was from this family that Martins Ferry took its name. During the late 1800s the city developed as an important industrial center and an important railroad hub and river port. From here products were shipped all over the United States and beyond. Over the past 50 years, the town's population has decreased significantly as industries have closed or moved elsewhere. Today the city's population is less than half of what it once was, and work is relatively scarce. Several notable celebrities were born in Martins Ferry, including James Arlington Wright, the Pulitzer Prize winning author and poet, and Cleveland Brown's Hall of Fame member Lou Groza.